Driving in Taiwan Bringing Kids? A billboard advertizes the presidential candidates for the 2004 election. There are basically two ways to come. You can sign a contract with a reputable company such as Hess, Sesame Street, ELSI and so forth. These are reliable, and will not exploit you intolerably. A view of Chaoyang University, in Wufeng, south of Taichung. Or, you can get together about a US$1,100 -1,500 or so and fly here. You should be working right away and the $1,000 will be enough to tide you over through the first couple of paychecks, if you are prudent. Some people (see links below) offer to locate English teaching jobs for you at no cost to you (the school pays them a locator fee). A fruit stand. There is a third way, a recruiter. However, recruiters have become widely detested by the foreign community in Taiwan for their many rip-offs. I'd avoid them. 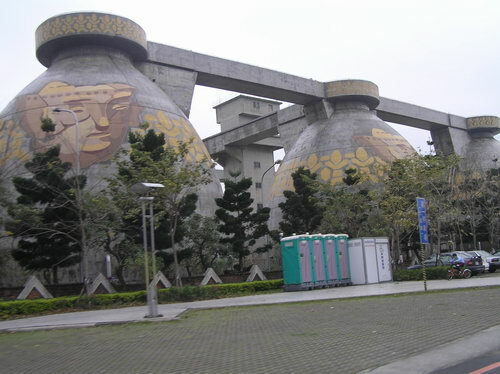 A sewage treatment plant in Bali, north of Taipei. Are you getting ripped off? The bottom line for expected pay is very simple: divide the monthly pay by the expected number of hours. In Taipei, if it is less than $400 per hour, it is pure exploitation. Outside of Taipei, it should be $450/hour (teaching pay is often higher outside of Taipei). That is rock bottom; average pay is of course higher. My son catching fish for fun in the local night market. An excellent alternative for those wanting a little more security than my assurance that you can easily get off the plane and find a job is Taiwan Teachers, which offers a wide variety of services for would-be teachers in Kaohsiung. I am recommending them. Check out their site! Be sure to check out my links page for other good sites. A fund raising carnival at a local school. Plan to stay for at least two years. The longer you stay, the more money you will make. You will make much more during the second year than the first. Don't worry. Plenty of signs in English. I want to come. What should I do? Crime and Safety Recreation and Travel Bringing Kids?